Though scattered, the remains discovered on this survey may provide significant insights into the long-distance and regional commercial connections of this quiet Roman province. Four weeks were dedicated to investigating a shallow shipwreck discovered during 2007, led by director Justin Leidwanger, INA Research Associate. The vessel appears to have been carrying a mixed cargo in at least three amphora types: jars from southeast Asia Minor, which predominate; a small number of a poorly documented type of unknown origin, perhaps from Cyprus itself or the neighboring mainland; and, of most interest, a form manufactured along the Mediterranean coast of France, alongside what we believe are local knock-offs of these more cosmopolitan Gaulish wine jars. Thick remains of a resinous lining probably confirm a wine content, and although additional non-cargo ceramics were recorded, no anchor or other ship fittings have yet been found. Bekker-Nielsen, T. 2004. The Roads of Ancient Cyprus. Copenhagen: Museum Tusculanum Press. Christou, D 1997. “Appendix: Some Brief Thoughts on the Ancient Harbor of Kourion.” In Res Maritimae: Cyprus and the Eastern Mediterranean from Prehistory to Late Antiquity, edited by S. Swiny, R.L. Hohlfelder and H.W. Swiny, 371-2. American Schools of Oriental Research Archaeological Reports 4. Cyprus American Archaeological Research Institute Monograph 1. Atlanta: American Schools of Oriental Research. Daszewski, W.A. 1981. “Port glòwny i przystanie pomocnicze w Nea Paphos w swietle obserwacji podwodnych.” Meander 6:327-36. Empereur, J.-Y. 1995. “Le Port Hellénistique d’Amathonte.” In Cyprus and the Sea, edited by V. Karageorghis and D. Michaelides, 131-8. Nicosia: University of Cyprus. Empereur, J.-Y., and C. Verlinden. 1987. “The Underwater Excavation at the Ancient Port of Amathus in Cyprus.” International Journal of Nautical Archaeology 16:7-18. Engvig, O., and P. Åström. 1975. Hala Sultan Tekke II. The Cape Kiti Survey. SIMA 44:2. Göteborg: Paul Åströms Förlag. Giangrande, C., G. Richards, D. Kennet, and J. Adams. 1987. “Cyprus Underwater Survey, 1983-1984. A Preliminary Report.” Report of the Department of Antiquities Cyprus:185-97. Green, J. 1973. “An Underwater Archaeological Survey of Cape Andreas, Cyprus, 1969-70: a Preliminary Report.” In Marine Archaeology, edited by D. Blackman, 141-79. Colston Papers 23. Hamden: Archon. Hohlfelder, R.L. 1995. “Ancient Paphos Beneath the Sea: A Survey of the Submerged Structures.” In Cyprus and the Sea, edited by V. Karageorghis and D. Michaelides, 191-210. Nicosia: University of Cyprus. Howitt-Marshall, D. 2003. “Cyprus Underwater Project 2002: A Preliminary Report.” Enalia 7:28-37. Karageorghis, V. and D. Michaelides, eds. 1995. Cyprus and the Sea. Nicosia: University of Cyprus. Katzev, S.W. 2005. “Resurrecting an Ancient Greek Ship: Kyrenia, Cyprus.” In Beneath the Seven Seas, edited by G.F. Bass, 72-79. New York and London. Katzev, S.W. 2008. “The Kyrenia Ship: Her Recent Journey.” Near Eastern Archaeology 71.1-2: 76-81. Leidwanger, J. 2005. “The Underwater Survey at Episkopi Bay: A Preliminary Report on the 2004 Field Season.” Report of the Department of Antiquities Cyprus (2005): 269-277. Nicosia: Department of Antiquities. Leidwanger, J. 2007. “Two Late Roman Wrecks from Southern Cyprus.” International Journal of Nautical Archaeology 36.2: 308-316. Leidwanger, J. 2008. “Cyprus.” In “Nautical and Maritime Archaeology, 2006–2007 Seasons.” by J.P. Delgado. American Journal of Archaeology 112: 307-335. (at pgs. 321-323). Leidwanger, J. and D.S. Howitt-Marshall. 2006. “Episkopi Bay and Beyond: Recent Collaborative Fieldwork and New Prospects on Cyprus.” INA Quarterly 33.2: 13-22. Leidwanger, J. and D.S. Howitt-Marshall. 2008. “Archaeological Applications for Remote Sensing in the Coastal Waters of Cyprus: The Experience of Recent Fieldwork and Methodology for the Future.” In Island Dialogues: Cyprus in the Mediterranean Network, edited by A.P. McCarthy, 15-33. University of Edinburgh Archaeology Occasional Papers 21. Edinburgh: University of Edinburgh. Leonard, J.R. 1995. “Evidence for Roman Ports, Harbours and Anchorages in Cyprus.” In Cyprus and the Sea, edited by V. Karageorghis and D. Michaelides, 227-46. Nicosia: University of Cyprus. Leonard, J.R. 1995. “The Anchorage at Kioni.” In Ancient Akamas, Vol. 1, Settlement and Environment, edited by J. Fejfer, 133-70. Aarhus: Aarhus University Press. Leonard, J.R. 1997. “Harbor Terminology in Roman Periploi.” In Res Maritimae: Cyprus and the Eastern Mediterranean from Prehistory to Late Antiquity, edited by S. Swiny, R.L. Hohlfelder and H.W. Swiny, 163-200. American Schools of Oriental Research Archaeological Reports 4. Cyprus American Archaeological Research Institute Monograph 1. Atlanta: American Schools of Oriental Research. Leonard, J.R. 2005. “Roman Cyprus: Harbors, Hinterlands, and Hidden Powers.” Ph.D. diss., State University of New York at Buffalo. Leonard, J.R., and R.L. Hohlfelder. 1993. “Paphos Harbour, Past and Present: The 1991-1993 Underwater Survey.” Report of the Department of Antiquities Cyprus: 365-79. Leonard, J.R., and S. Demesticha. 2004. “Fundamental Links in the Economic Chain: Local Ports and International Trade in Roman and Early Christian Cyprus.” In Transport Amphorae and Trade in the Eastern Mediterranean. Acts of the International Colloquium at the Danish Institute at Athens, September 26-29, 2002, edited by J. Eiring and J. Lund, 189-202. Monographs of the Danish Institute at Athens 5. Athens: Danish Institute at Athens. Manning, S.W., S. Monks, D. Sewell, and S. Demesticha. 2000. “Late Roman Type 1A Amphora Production at the Late Roman Site of Zygi-Petrini, Cyprus.” RDAC: 233-27. Manning, S.W., D.A. Sewell, and E. Herscher. 2002. “Late Cypriot 1A Maritime Trade in Action: Underwater Survey at Maroni Tsaroukkas and the Contemporary East Mediterranean Trading System.” Annual of the British School at Athens 97: 97-162. McCaslin, D.E. 1978. “The 1977 Underwater Report.” In Hala Sultan Tekke 4. SIMA 44:4. Göteborg: Paul Åströms Förlag. Parker, A.J. 1992. Ancient Shipwrecks of the Mediterranean & the Roman Provinces. BAR-IS 580. Oxford: Tempvs Reparatvm. Sakellariou, D. 2007. “Remote sensing techniques in the search for ancient shipwrecks: how to distinguish a wreck from a rock in geophysical recordings.” Bulletin of the Geological Society of Greece 37.4: 1845-1856. Sakellariou, D., D. Kourkoumelis, P. Georgiou, P. Micha, A. Mallios, T. Theodoulou, V. Kapsimalis, and K. Dellaporta. 2007. “Searching for ancient shipwrecks in the Aegean Sea: The discovery of Chios and Kythnos Hellenistic wrecks with the use of marine geological-geophysical methods.” International Journal of Nautical Archaeology 36.2: 365-381. Swiny, S., R.L. Hohlfelder, and H.W. Swiny, eds. 1997. 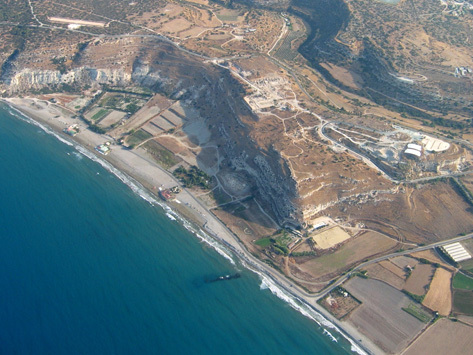 Res Maritimae: Cyprus and the Eastern Mediterranean from Prehistory to Late Antiquity. American Schools of Oriental Research Archaeological Reports 4. Cyprus American Archaeological Research Institute Monograph 1. Atlanta: American Schools of Oriental Research. 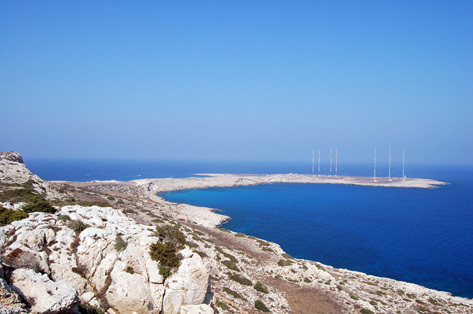 ABOVE: The low headland of Cape Greco, viewed from the high plateau farther west (Photo: Justin Leidwanger).